These beautiful and powerful words are from the beginning of Psalm 19 -- I was reminded of them when I saw these stunning photographs. That's our Sun, the giver of life and all the sweetness and pain that life can hold. Thou madest him a little lower than the angels; thou crownedst him with glory and honor. Now to the illustrations: the top one is described this way: Mercury and the Sun, the view through Hinode's X-ray Telescope. The arrow points to Mercury. The bottom one is described this way: When the transit began, that is, when Mercury moved directly in front of the sun's surface, Hinode zoomed in using another of its telescopes, the SOT (Solar Optical Telescope). The images reveal Mercury as no mere speck but a full-fledged planetary disk. To appreciate the majesty and power of a typical G-type star, you need only glance at this photo [the top photo]: The tiny black speck is Mercury. The star looming in the background is our own sun. 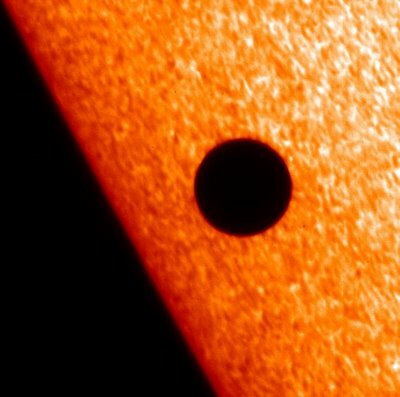 The Japanese Space Agency's new orbiting solar observatory, Hinode (formerly known as Solar B), took the picture on Nov. 8th just as Mercury was about to begin a rare solar transit. Thousands of people on Earth saw and photographed the event, but Hinode's photo is like no other because it shows the view through an X-ray telescope. "Hinode's X-ray telescope, the XRT, is the best solar X-ray telescope ever flown," says John Davis, NASA's Hinode project scientist at the Marshall Space Flight Center. "The XRT has arc-second resolution and can take pictures as rapidly as once every second." X-rays interest solar physicists because they reveal the hottest gases in the sun's atmosphere. The bright flourish just above Mercury, for instance, is a gigantic mass of million-degree plasma trapped in the magnetic field of a sunspot. Viewed through an ordinary white light telescope, that hot mass would be almost completely invisible. Truly, "these are unique images," says Davis. When the transit began, that is, when Mercury moved directly in front of the sun's surface, Hinode zoomed in using another of its telescopes, the SOT (Solar Optical Telescope). The images reveal Mercury as no mere speck but a full-fledged planetary disk. Viewing the movie [this refers to another link in this article], Davis points out "the motions in the background." The sun's surface boils like water atop a hot stove. Each of the bubbling "granules" is about the size of a terrestrial continent. Hinode, just launched in September, is still in the shake-down phase of its mission. Ground controllers are testing Hinode's telescopes and other systems and don't expect to begin routine science operations until next month. 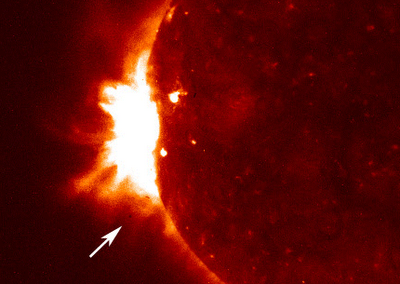 The transit of Mercury is just a hint of what's to come.